Let's face it. No one cruises to Hawaii just for the food. And yet despite its geographical isolation, Hawaii has one of the most varied cuisines of any of the 50 states of the US. For that, thank its multi-cultural population. When humans arrived 1500 years ago they found little that was edible. Virtually every plant or creature that now flourishes had to be introduced. Wave after wave of indentured workers worked in the sugar and pineapple plantations. Afro-Americans came escaping the cotton fields of the Deep South, along with the Chinese, Japanese, Portuguese, Filipinos and Koreans – all cooking basic recipes from their native lands for bodily and spiritual nourishment. Over decades, Hawaii's mixing pot got stirred. Today you'll find cross-over delicacies – and culinary abominations – that don't exist outside Hawaii. Sure, you can spend an entire holiday in Hawaii eating freshly caught seafood, Wagyu-sourced beef and fancy salads. But you must try at least one of these local treats. This Hawaiian classic is served (reinvented) in many fine restaurants. But the authentic version is "a plate lunch", beloved by Hawaiian manual workers. It's white rice, a hamburger pattie and lashings of brown gravy, topped with a fried egg. The local advice is to break the egg first and watch the yolk run over the rest of the plate before your first bite. 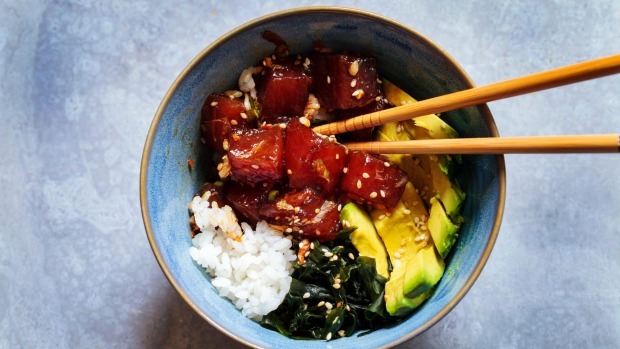 Hawaii's version of ceviche emerged from the Japanese community. Small cubes of raw fish (commonly tuna) are marinaded in soy, sea salt, sesame oil and seaweed, then served over a bowl of rice. Food historians say these deep-fried doughnuts originated mid-Atlantic on the Azores and were introduced by the Portuguese. Though they're traditionally ungarnished, Hawaiians made them more fattening by adding fillings – coconut-flavoured haupia pudding, anyone? Traditionally, Hawaiians lived on poi, a thick paste made from the root of the taro plant (a relative of the sweet potato). Try it as a side dish, but don't order unless you love the taste of starch pudding. Long before Spam became a Monty Python joke or term for unwanted email, it was a processed meat. The canned meat, which needs, no refrigeration, became a staple of US troops after Pearl Harbour was attacked in 1942. Hawaiians adopted Spam, and its most famous reinvention is a delicacy (ironically) part American/part Japanese. Spam musubi is a slice of fried Spam on a sushi-sized tablet of rice wrapped in seaweed. 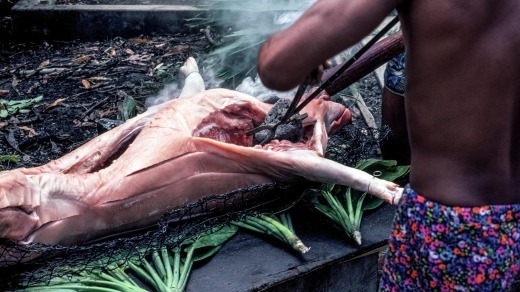 Pigs are not native to Hawaii yet now run wild in the mountains and are the basis of every luau night (Hawaiian barbecue). This dish is the result of the underground ovens you'll find all over the Pacific called an imu. Slow-cooked meat, buried with red-hot coals, emerges as a delicious, smoky version of pulled pork. Also made from the taro plant, but more appealing. This time, taro leaves are used to wrap morsels of Kalua pork, then placed in the imu. The leaves protect the pork, but turn crispy, leaving the meat succulent and juicy. In modern Hawaii you'll find fish or chicken alternatives. Salmon isn't a native Hawaiian fish. So this dish, consisting of (imported) salmon, tomatoes, onions and chilli, combines four ingredients introduced to the archipelago from other parts of the world (which makes it typical). The onions arrived first (reputedly introduced by Captain Cook), followed by tomatoes (first planted by Spanish horticulturalist Francisco de Paula Marin in the 1790s). Canadians introduced the frozen salmon when the Hudson Bay Company had a 19th-century branch office in Hawaii. A favourite served in homes throughout Hawaii, this Japanese-inspired dish involves bite-sized pieces of chicken marinated in a sweet/salty sauce, coated in a mochiko (rice flour) batter and fried until golden brown. This bizarrely-named dish arrived with the Chinese in the 19th century. The odd thing is that no rice is involved. The main ingredient is the long transparent noodle made of starch and water, which in Australia is known as "glass noodle". Not the deep-fried kind served with hash browns and a sunny-side-up egg in a 1950s-style US diner. No, these are equally delicious dim sum-type Chinese dumplings with centres of pork (or shrimp) and chestnuts. Now, we're getting to the hard stuff. This may be the epitome of multi-cultural Hawaiian cuisine. Imagine an egg-noodle soup introduced by the Chinese, which eventually became soaked in a Japanese broth. Over the decades, add Korean kimchi, Portuguese sausage, onions, and (of course) Spam. The concept was invented in China around the 7th century, before being imported to the US by Japanese migrants. But Hawaii has become its spiritual heartland. Basically, an ice block is shaved, with the chips put into a paper cup, then doused in the fruit sauce of your choice. Barack Obama, born and raised in Hawaii, grew up on them. Norwegian Cruise Line's Pride of America is the only cruise ship that visits four Hawaiian islands in a seven-day cruise (departing and returning every Saturday) ncl.com/au/en/cruise-ship/pride-of-america. Steve Meacham was a guest of Norwegian Cruise Line.